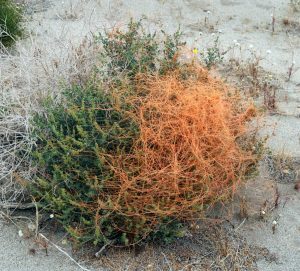 Orange strands of dodder nearly cover a native burro bush, Ambrosia dumosa, in Anza Borrego Desert State Park, California. Dodder is a group of ectoparasitic plants with about 150 species in a single genus, Cuscuta, in the morning glory family (Convolvulaceae) or Cuscutaceae, depending on the classification system used. These pale green or yellow, bright orange or red plants, found throughout tropical and temperate regions of the world, have been given all sorts of common names alluding to the string-like appearance of the plants: angel hair, devil’s hair, devil’s ringlet, goldthread, hairweed, lady’s laces, strangleweed, witch’s hair and many others. The thin, string-like stems intertwine over a plant. These plants have very thin, sting-like twining stems that appear to be leafless. They do have leaves, but they are reduced to tiny scales that are barely visible. Most species have very low levels of chlorophyll, so are not green. Because of the lack of chlorophyll most produce very little food on their own, and therefore depend on their host plants for nutrition. The plants cover their host plants in a spreading, tangled mass of intertwined stems, especially where growing in full sun (twining and attachment is greatly reduced in shaded areas). Dodder strands on jewelweed, Impatiens capensis, in Wisconsin. Dodder species are variable in the habitat they are found in naturally and the number of different host species they can infect, with some restricted to just a few host plant species and others able to infect a wide range of hosts. A wide variety of herbaceous and small woody plants can be parasitized by dodder, including many agricultural crops such as alfalfa, asparagus, carrots, cranberries, onions, and potatoes, as well as many ornamental plants, including chrysanthemum, dahlia, helenium, impatiens, English ivy, periwinkle, petunia and trumpet vine, and many weed species including field bindweed (Convolvulus arvensis), lambsquarters (Chenopodium album), and pigweed (Amaranthus species). Dodder can weaken or kill plants and reduce crops yields. The impact on the host plant varies considerably depending on the species of dodder, the growth stage and condition of the host plant, and the time of infection. Infected plants are also more susceptible to diseases and insect problems. 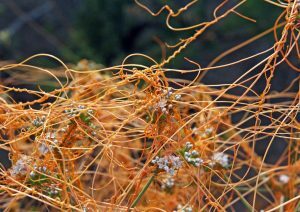 Dodder grows on host plants, wrapping around its stems and leaves, and attaching to its vascular system. 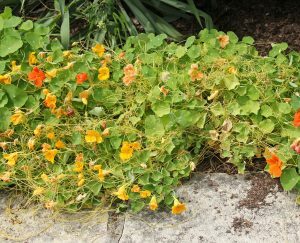 In temperate areas dodder is an annual that grows from seeds each growing season. After germination at or near the soil surface, the seedlings grow quickly toward a host plant, possibly in response to volatiles released by preferred host plants, coiling around any object it encounters. If a suitable host plant is not reached within 5-10 days the seedling will not survive. Once a suitable host plant is reached, the seedling wraps itself around the plant and produces special structures, modified adventitious roots called haustoria, that are inserted into the host’s vascular system. Once the dodder is established on the host plant its original root in the soil dies. The dodder plant then continues to grow rapidly on that host plant, continually making new attachments to the host and eventually covering it – or spreading to adjacent plants – until the dodder plant is killed by frost. Since they have to re-establish from seedlings each year, species in temperate areas are only found in relatively low vegetation, whereas species in tropical areas, where plants can grow continuously, may reach high into the canopy of shrubs and trees. Tiny 4 or 5-parted white, yellow or pink bell-shaped flowers are usually borne in clusters (occasionally singly) in late spring to early fall, depending on the species. These are followed by small rounded fruits or seed capsules the same color as the stems that contain 2-3 seeds. Dodder is a prolific seed producer; a single plant can produce thousands of seeds. The small seeds have a hard, rough seed coat that enables them to survive in the soil up to 20 years or more, depending on the species and environmental conditions. Dodder seeds are spread primarily through the movement of soil and equipment by humans, or in infested plant material or as a crop seed contaminant, and for some species by water. The small flowers are produced in clusters (L and LC), with 4 or 5 petals of white or other colors, depending on the species (RC) and are followed by rounded fruits (R; photo from Wikipedia). 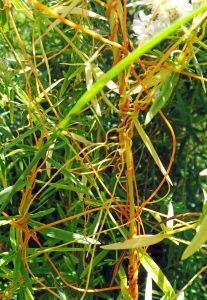 Dodder is not commonly found in gardens or ornamental landscapes, but if observed it should be removed immediately as dodder is difficult to control once introduced. Effective management requires a systematic approach combining several control methods over several years focused on reducing the current population, preventing seed production, and dealing with new seedlings in subsequent years. Any seedlings not yet attached to a host plant should be pulled (they are generally difficult to find, however). Once attached to a host plant, complete eradication from the host plant is usually not possible as dodder can grow back from haustoria embedded in the plant. Pruning is of little benefit unless only one or two branches are affected and can be removed without destroying or disfiguring the entire plant. So unless the plant can be pruned significantly lower than the dodder it is best to remove the entire host plant or kill both the dodder and host plant with a non-selective herbicide, such as glyphosate. If the dodder plants have already set seed, burn them (if allowed locally) or dispose of them in the trash. In areas that have been infested previously, the area should be monitored closely for the presence of seedlings and pull them as soon as they are seen or the soil can be treated with a preemergent herbicide before seeds germinate in spring. Control any weeds that could serve as hosts. If the area is planted annually, choose plants that are not susceptible to attack by dodder, such as ornamental grasses and other monocots, including lilies. In agricultural crops, dodder is managed by rotation to non-host crops, use of dodder-free seed, cleaning equipment between fields, control of weed hosts, and chemical control in infested areas. Rope dodder, Cuscuta glomerata. Photo by Aaron Carlson, Online Virtual Flora of Wisconsin at http//:wisflora.herbarium.wisc.edu. Hazel dodder (Cuscuta coryli) is found in sandy lake margins, mud flats and moist fields. It is often found on hazelnut (Corylus spp. ), as well as reported infecting aster, common milkweed (Asclepias syriaca), Mondarda, sunflower (Helianthus sp. ), Canada goldenrod (Solidago canadensis), and members of the mint family (Lamiaceae) and many other plants. 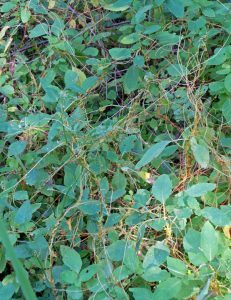 Rope dodder (Cuscuta glomerata) is found in a variety of moist habitats, and blooms from July through September. It can be distinguished from other Cuscuta by having the inflorescences densely bunched together giving the plant a thick, rope-like appearance. It is reported as having a preference for members of the Aster family, often on sunflower, Canada goldenrod, and spotted water hemlock or spotted cowbane (Cicuta maculata). Field or five-angled dodder (Cuscuta pentagona = C. arvensis, C. campestris) is found along fields and roadsides. 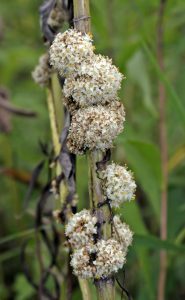 Knotweed or smartweed dodder (Cuscuta polygonorum) is also found in moist habitats including wet prairies, coastal plain marshes, and the margins of commercial cranberry bogs. It is distinguished from other Cuscuta by its very short styles and its host plants including Bidens spp., Polygonum spp., Panicum capillare, Setaria glauca, Rorippa islandica, and Hypericum boreale. Most species of dodder are on the federal noxious weed list, except some native species and a few widespread non-native species, but all dodders, including the natives, require federal permits for importation or transportation of seed. Wow, I’ll definitely be on the lookout for this one. The names are great. Devil’s ringlet? Strangleweed? OK. I’m fascinated by the idea of a parasitic plant (just not in my own garden, thanks). I also wonder if there are other examples of parasitic plants in WI or elsewhere? I have never seen this plant. But put this on my list of weird plants. If Wisconsin has these plants I have never seen them. Also I am glad that I have never seen them in my garden. Dodder grows amazingly rapidly when conditions are right. It is easy to imagine it’s potential to stunt or kill soft competing plants. Interesting article! I haven’t ever seen this plant and I hope I dont get it in my gardens. I have not seen the dodder but I am sure it is my area. I will be watching for it. Great article. I have noticed this a couple times in the Fox Valley. I didn’t realize there where different species. Another reason to control weeds that can serve as hosts. Interesting that the root dies once haustoria insert into the host plant. I have seen this plant, but will watch for it. Very invasive! Very interesting article, amazing what some plants will do to survive and thrive. Fascinating to learn about this parasitic plant. Had no idea that once it attaches to its host, it’s original roots die off. So this is an interesting plant to read about. It was interesting to learn that dodder doesn’t produce a lot of chlorophyll on its own. Its large seed production and long-lasting life of the seeds is also pretty amazing. Are there other parasitic plants in Wisconsin? Haven’t noticed it before but will certainly now be on the lookout for it. Hopefully I will never have to encounter dodder. A lot of work in trying to get rid of it. Dodder would probably not make good fodder. Haven’t seen it around and hope not to. It never ceases to amaze me the intelligence of plant tissue; the fact that dodder will grow to seek a host plant and once it attaches its haustoria to the host the original root dies plus the fact it can redevelop a plant if a haustoria remains after removing the rest of the plant. This is one we need to watch very closely. How parasitic. Ugh. We have had a vine that has been growing along the edge of our lower woods. I don’t know if it was Dodder or not but I’ll be keeping an eye out for it this coming season. If it is, it sounds like we will have a hard time getting rid of it. I have seen dodder, but never knew what it was. Such an interesting plant and diabolical. Now that I know about it I will watch for it and get rid of it when I can. I have not seen this yet but I do grow several of the host plants. Will have to keep an eye out for Dodder. Thanks for posting.